I have never imagined that i will be making laddu at home. Iam flying high that i have learned a traditional sweet with ease. For the past week, i was trying few traditional sweets, so laddu also became a part of my experiment. i kept asking my friends for boondhi karandi(perforated laddle) & one of our friend Anitha got her MIL's boondi karandi for me. that was a sweet gesture from her. Thanks Dear! I had to gain a lot of confidence to try boondi, as i remember my mom's first attempt of making laddu was a failed attempt. 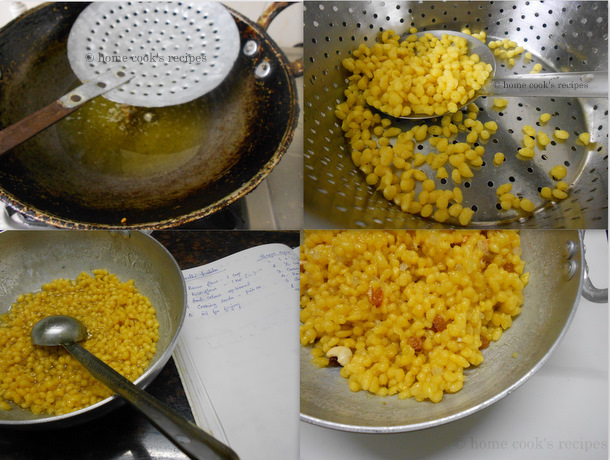 after referring so many blogs and mallika badrinath's sweet book, i went on to try boondi yesterday. Yesterday i discovered that, Laddu is one of easiest traditional sweet to make. The trick is on besan flour mixed with water. 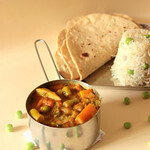 it should not be thick or watery, just like our dosa batter. if this is kept in mind, every other things make you way for perfect laddu. also keep washing the boondi karandi after every batch and wipe it dry with a clean cloth before starting the next batch.this will make all boondis look even. 1. Get ready with boondi laddle and other laddles, as shown in the pic below. also have a strainer, to strain the oil from deep fried boondi. (you can also strain the boondis in a kitchen paper towel). have a dry clean cloth for wiping the boondi laddle after every batch. 2. Heat Oil for deep frying boondi's in a wide pan, so that the frequency of making boondis will become less and make more boondi's in every single batch. 3. Simultaneously to prepare sugar syrup, in a pan, add 1 cup of sugar and 1/2 cup of water. when the sugar syrup boils, switch the flame to medium. check for single string consistency. you will get it in 5-6 minutes. the sugar syrup will be like honey. you can check single string, by swiping little syrup on your index finger, rub it on thumb and slowly stretch, when you get single string consistency switch off the flame and close the syrup with a lid. 4. Sieve Besan flour and cooking soda together. add water and mix it thoroughly without any lumps. see to that the besan flour and water mixed to correct consistency. 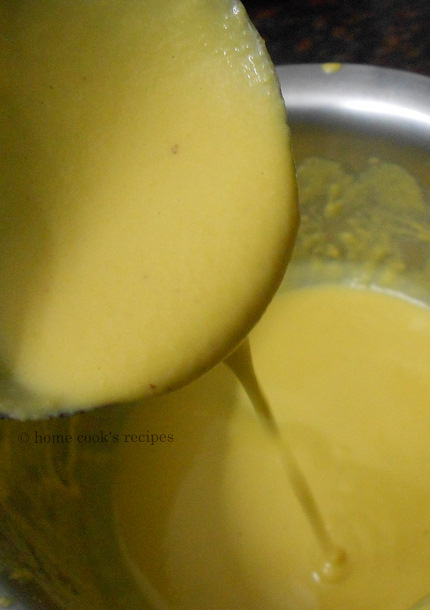 it should be like our dosa batter. 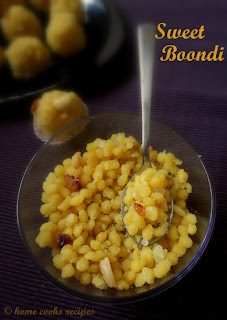 you can check by pouring a little batter over the boondi karandi and see the boondi's are easily falling out or not. if its not ease, mix little water. 5. 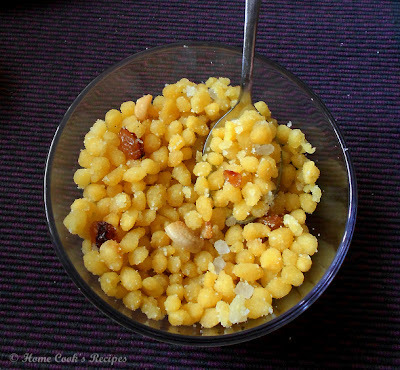 Take a laddle full of besan flour mix and pour over the boondi karandi placed little above the heated oil pan. see the boondi's falliing out. 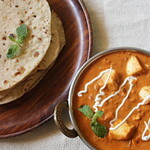 just spread the laddle, like we spread the dosa batter over tava. Fry the Boondi's exactly for 1 minute. i left the boondi's in high flame for 1/2 minute and in low flame for another 1/2 minute. 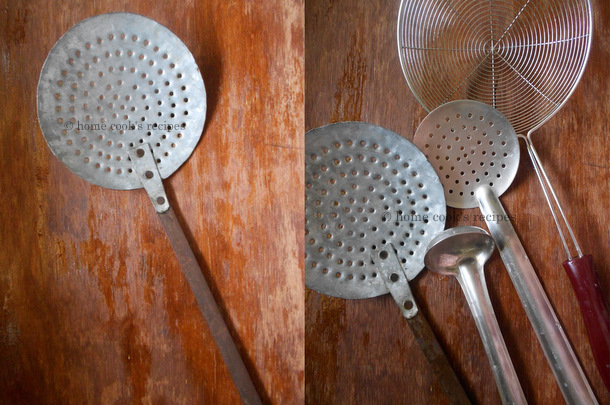 remove the boondi's to a strainer. 6. Wash the boondi laddle and wipe it clean and dry and start the next batch. dont fry the boondi till they turn golden colour, we dont want crispy boondi for sweet boondi. 7. On finishing making boondi's, add the strained boondi's to warm sugar syrup and mix well. 8. 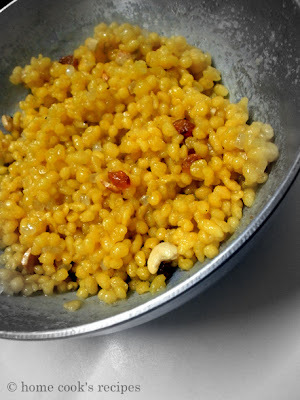 Heat a small pan, add ghee and fry cashews, raisins, cloves and add to the boondi mixed with sugar syrup. 9. Add crushed cardamom and 1/2 tsp of crushed sweet rock candy(kalkandu) & 1/2 tsp uncrushed. 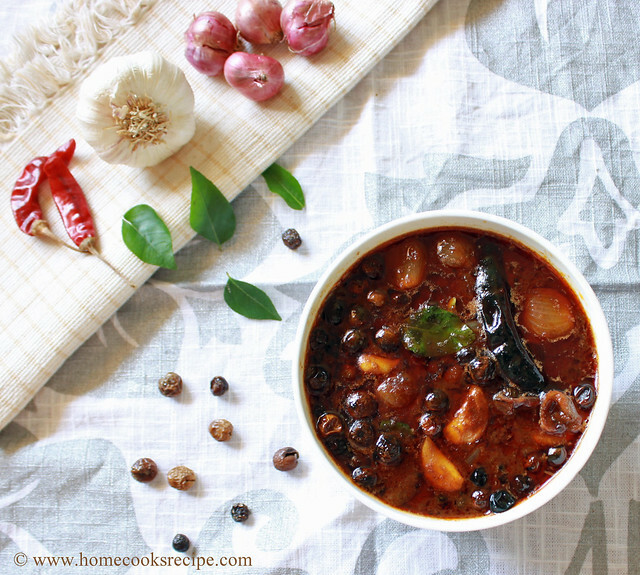 mix all together with the boondi mixture. run your fingers over the boondi and rub them to seperate boondi's sticking to easch other. 11. Always give atleast 2 hrs standing time for boondi's and serve. Store the boondi's in air-tight container. it keeps well for a week and more. 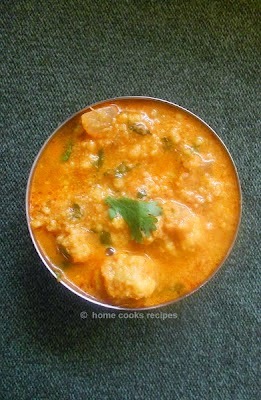 To make Laddu, its just one step short, anyways will tell you in my next post with laddu pictures. Its so easy to make, it turned out so tasty and perfect. hubby and kid loved very much. only point is you got to have boondi laddle and mix the besan flour with water in correct proportion. Yumm and delicious luking Boondhi.Luks like Fe(a)stivities have started .Luv it. I could feel the taste of these ladoos :D Yummy it is!! Looks so nicely done Lavi, my fav...enaku entha sweet than pidikathu ;) Yummy looking sweet boondhi! Delicious, I made the same yesterday! !